Email is the life blood of any business today. Migrating on premises Exchange Server is no easy task. Whether your going to Hosted Exchange Server or Outlook 365 the migration path can be very different. We setup most Hosted Exchange account with Microsoft. Microsoft offers completive per user pricing. Microsoft built Exchange Server so you get the best possible architecture available. Your Email runs on Microsoft's Servers so the up-time is unmatched. lilGeeks can design the right path based on your companies needs and with the right planning implement that migration plan with minimized users downtime. No one wants to be without email! 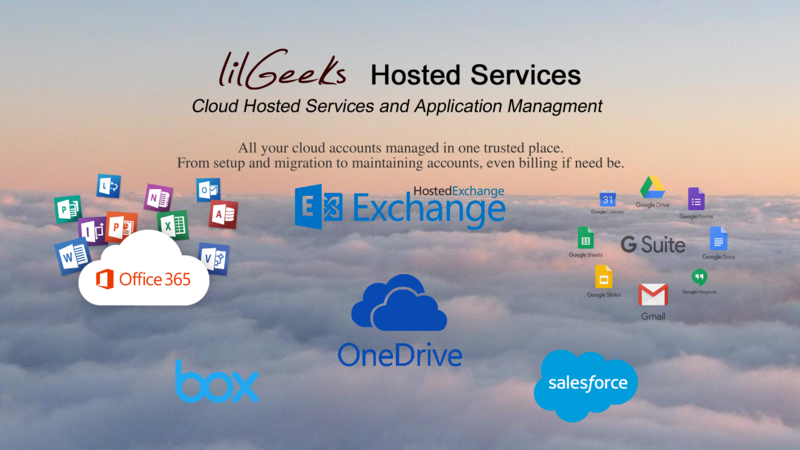 All your cloud accounts managed by one trusted sourse. From setup to migration and maintaining the accounts.